* I'm trying not to depend on and non-free parts like DCOS' awesome dcos package feature to install software packages from mesosphere repository. Since I have only 6 machines at home, I'll use 3 of those both mesos-master and mesos-slave, this is not ideal but they can work together. Here are the commands to setup this cluster. I'm using ubuntu user on my hosts, and adding it to docker group. You may need to change it with your username. And I will also use domains ending with '.mesos', please don't mind that domains for now, I'll explain it under the mesos-dns section. Packages from Mesosphere are using a mesos-init-wrapper to allow easy configuration of the services, all I need to do is creating some files under /etc/mesos , /etc/mesos-master or /etc/mesos/slave, documentation about how to use these is already in the file. haproxy-marathon-bridge will soon be replaced by servicerouter.py, but I'll go on using haproxy-marathon-bridge for now since it's easier to install. I installed mesos from Mesosphere's mesos deb package, and that package includes both mesos-master and mesos-slave services. For the slave nodes, I need to explicitly disable mesos-master service, since Mesosphere's mesos deb package enables it by default. zookeeper package is also installed on slaves because it's recommended by mesos package, I also need to disable it's service. Mesosphere already prepared a mesos-dns docker image but current image forces me to create a config file first and upload it somewhere and let marathon pull that file before running the container.This introduces another problem, if I need to update some parameters in mesos-dns config, I need to update the remotely hosted file and restart service. This adds an extra step to managing a simple service. 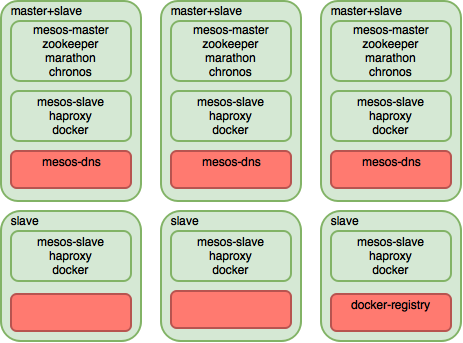 Mesos-dns does not need many configuration parameters, so all configuration parameters can easily be passed from environment variables. I found that mesos-dns docker image is generated by a different repository called mesos-dns-pkg to unify mesos-dns package creation for various environments. I tried to hack around this repo to add this feature to upstream repo so that I'll have free updates for later versions, but after looking around the the build process in that repo I gave up, created my own mesos-dns image instead and created an issue for upstream repo. Now I can just start mesos-dns service on marathon using some environment variables without dealing with config file hassle. In my case I can reach the host with using it's IP address,if you are trying this in a cloud environment you may need to map a public IP to the host and allow port 8080. From now on I don't need to use IP addresses for anything, I can use *.mesos domain name to reach services in my cluster. mesos-dns also supports SRV records, which can also gives you the port number of each instance (3rd field) and hence can be used as a service discovery mechanism. You can see the DNS name mapping rules in mesos-dns naming docs. And now I can create my own docker-registry service using DNS names instead of IP addresses. Since I don't have a persistent storage solution myself, for now I'll use S3 back-end for docker registry. First I created an S3 bucket called bdgn-docker-registry and created an IAM user to reach it. You need to replace S3 parameters below with your bucket and IAM user. I will replace this S3 back-end with a local one once I have it. 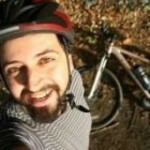 _docker-registry._tcp.marathon.mesos. 10 IN SRV 0 0 31793 docker-registry-55352-s3.marathon.mesos. In this example we also need to uncover the port mappings between inside the container, on the host and the service level on the haproxy. But I'll leave this to another blog post as well. And I did try killing the container several times and every time I tried it, a new container showed up in another random host again. I'll then explain how I'm running OpenVPN on this cluster.